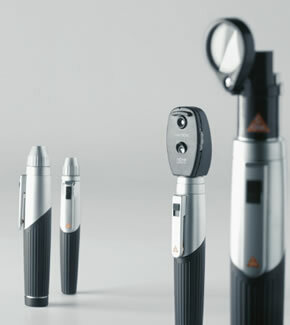 Compact pocket otoscope with direct illumination. Enhanced XHL Xenon Halogen Technology with 100% more light. Very bright, concentrated white light for perfect illumination. Viewing window with 3x magnification and optimized casing surface for razor-sharp images and minimal reflection. Attachment clip with integrated on/off switch. Secure. Switches off automatically when returned to the pocket. 20.000 switch cycles guaranteed. High-quality handle: Chrome-finish upper section/ refined plastic. Shockproof, sturdy, non-slip. Rechargeable mini 3000 handle. The mini 3000 battery handle can be retro-fi tted with the mini rechargeable battery 2.5V NiMH and the bottom insert to update to a rechargeable handle. Fully-automatic charging with the mini NT charger.